Looking for something subdued but festive to wear to the office Christmas party? 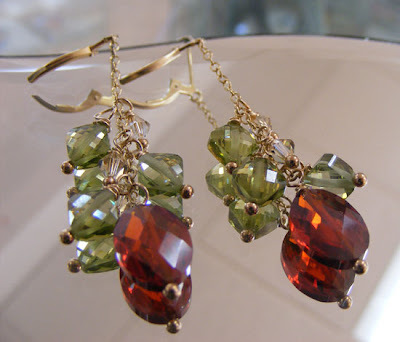 Try these earrings, which combine richly coloured cubic zirconias, swarovskis and gold filled chain and findings. Pretty enough to be made into heirlooms! When I first saw these curvy tubes - I thought that would make an amazing necklace - but I soon discovered from working with them, that the radius of the curve is so tight, that threading any significant number of them is tedious beyond my ability to endure. So - time for a re-design! 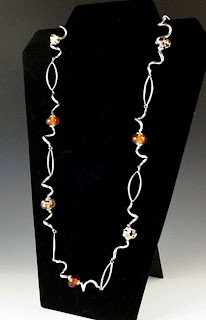 These light pointed oval links were also speaking to me, and so I designed to combine the two in one necklace. The beads are mine own lampwork (which I had intended to put into a bracelet - so that means I'll have to make more!). Any similarly sized bead that you like will do. The over all effect, especially when worn with black, is a very graffic scribbly kind of look.